Consider yourself …Invited to a delicious, mouth-watering family meal with the Micheff Sisters as they serve up more than one hundred recipes of their Family Favorites for every meal of the day! Linda, Brenda, and Cinda have been cooking together since they were kids. 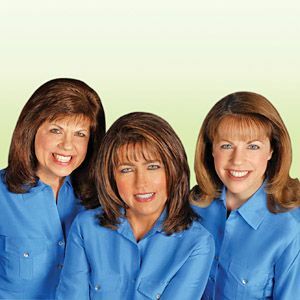 Now they are reaching millions of viewers each week with their nutritional wisdom, cooking expertise, and a whole lot of fun and laughter on their popular 3ABN television program, Cooking With the Micheff Sisters. This unique cookbook shares their time-tested and best-loved recipes for breakfasts, sandwiches, soups, entrees, desserts – great for any time the family is gathered together! There is even a special international section featuring recipes from around the world. Try Grammy’s Granola, Mama’s Spanish Rice, or Thai Vegetable Curry. Or whip up Linda’s Irish Mashed Potatoes, Cinda’s Vegeburgers, or Brenda’s Summer Peach Tart. On each page, you will find a simple, time-saving recipe that will quickly become a treasured favorite in your family. From the Micheff Sisters’ kitchens to yours, this cookbook is sure to spice up your family gatherings with new favorites and precious memories that will last a lifetime. Start sharing these Family Favorites today!